Winner of the Transat AG2R La Mondiale, top rookie and 13th overall in La Solitaire du Figaro - Eric Bompard Cachmire; Gwénolé Gahinet managed his first season on the Figaro Bénéteau circuit very successfully. 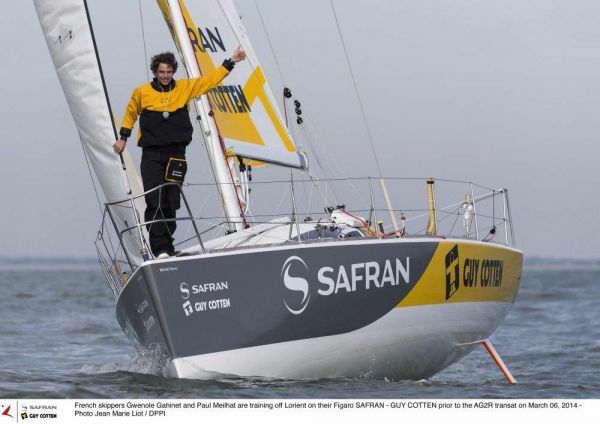 In 2015, once again at the helm of the Figaro Safran-Guy Cotten, the young sailor plans to make further progress and carry the colours of his partners even higher. On the programme are three races: La Solo Maître CoQ, La Solitaire du Figaro - Eric Bompard Cachmire and La Generali Solo. At 30, Gwénolé Gahinet, who was primarily known for winning the Mini Transat 6.50 in 2011, has just had an exceptional year with his partners Safran and Guy Cotten. The two companies, who have chosen to focus on this young talent from Lorient, have not made a mistake, because in his first official race, the sailor won the double-handed Transat AG2R La Mondiale with Paul Meilhat. "The victory in St Barts will remain the best memory of this year,” says Gahinet. “The start of season all happened very fast, but I worked hard with Paul and Tanguy Leglatin, the coach of the Pôle Lorient Grand Large (the offshore training centre). That paid off and it was a great reward for the whole team.” A month later, after four intense weeks of racing, the skipper of Safran-Guy Cotten finished as the top rookie and 13th overall in the legendary Solitaire du Figaro. Mission accomplished for Gwénolé Gahinet. "On La Solitaire, I feel I have made a great deal of progress and for this coming year, I will be more focused on solo racing,” says Gahinet, who has already resumed training. “Now I know how to handle the boat. The goal is to improve, refine and perfect. I’m working on speed, tuning and starts. Tanguy Leglatin also decided to include some outside voices in our workouts throughout the year to get different perspectives on our work, it’s a positive step. We have a good training group in Lorient, things are moving,” adds the skipper of Safran-Guy Cotten. On Monday evening, at the traditional Evening of Champions at the Paris boatshow, where the awards for the annual winners for inshore or offshore racing are held, Gahinet and Meilhat will receive a prize for their victory in the Transat AG2R La Mondiale.